Many teachers implement classroom economies....as a matter of fact I remember my very own 4th grade teacher doing it so many years ago! And it remains one of the fondest memories I have and is actually the reason I ever began doing it to begin with. 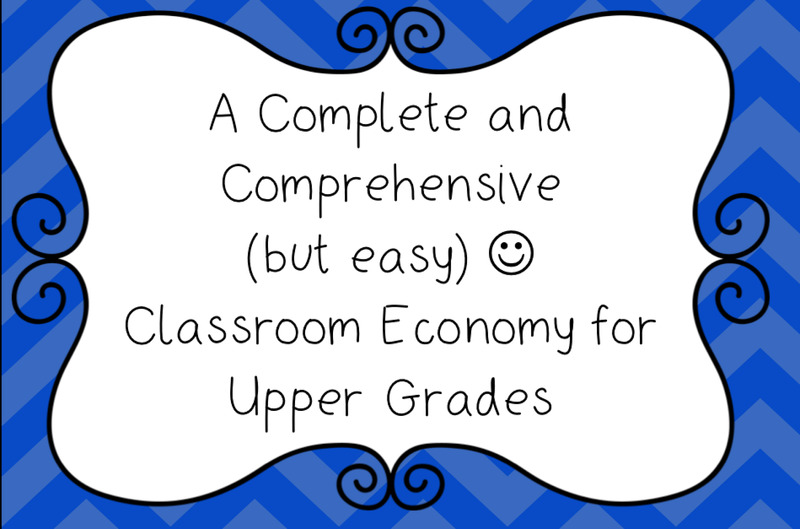 However, you will see many variations of the classroom economy depending on the teacher you talk to. Since I work at a private school, we often have parents touring the school and my classroom economy is actually something the principal always likes me to discuss with them. The parents LOVE it! And so do the kids. Each year I begin the first week of school with giving each student a copy of the classroom newspaper. Really it's just consists of Help Wanted ads and Classifieds. 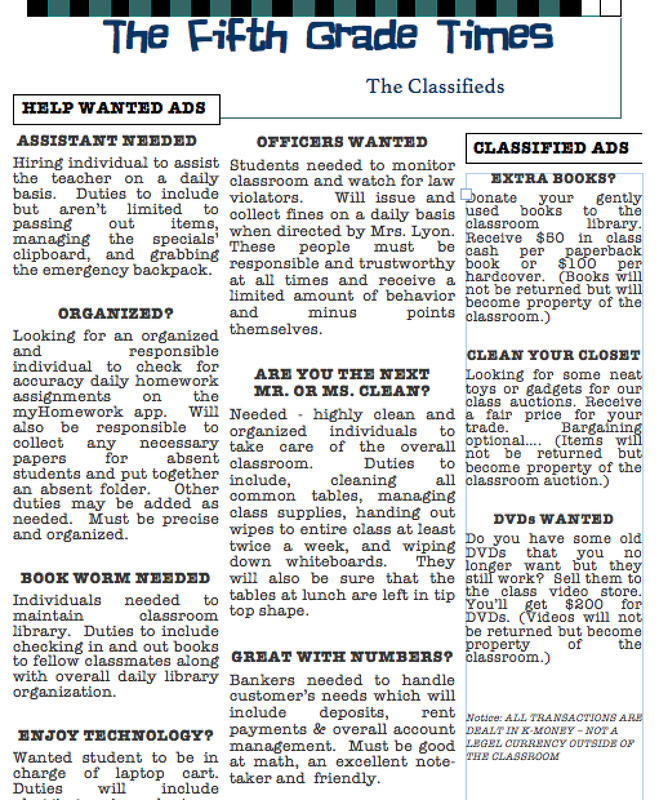 Depending on the school year, I update the Help Wanted ads with the jobs that will be available that year. Students are told to read through the ads and think about 3 of the positions that they would like. Jobs are held the ENTIRE year as some require "training" and I don't want to spend too much time having to do that throughout the year. Many positions have multiple people who have the same job. The classifieds let students know about things that I will purchase (like books, old toys, etc) for the classroom library and swap shop. 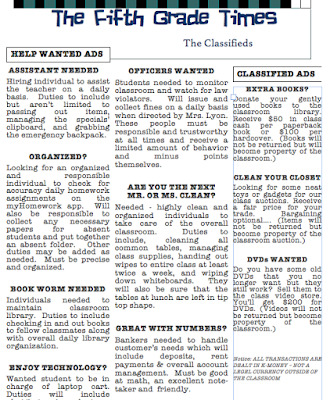 After students have had some time to look over the newspaper ads, they then fill out an online job application. You can view the application here. 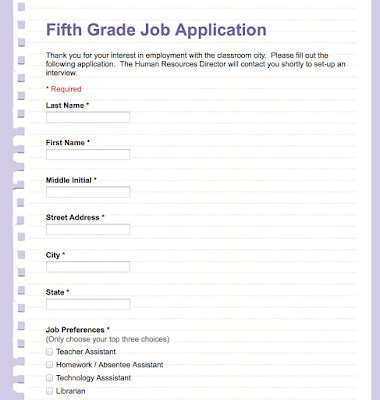 Before students fill it out, we discuss the different components of the application and why each part is important (like an emergency contact number). This is where you find out which of your students KNOW their address and those who don't. I make it a requirement that all students know their addresses as I think it's super important. After students have filled out their job applications, the Google Form will neatly input all the information into a spreadsheet for me. I use that spreadsheet to look over the information and set-up interviews. Here is what my online job application looks like. You can easily create one using Google Forms. Prior to doing job interviews with the students, we discuss what they think would make someone want to hire you. We talk about only have about ten seconds to make that great first impression. I even instruct them on how to give a firm handshake and to make sure they are giving good eye contact. I set-up the interviews with each student in advanced - this way students know to make sure their hair is combed, clothes are nice and neat (my students wear uniforms so we talk about having shirts tucked in, etc), clean hands and more. I always give them a heads up about some of the questions I will be asking so they can think about their responses beforehand. It's important to note, I usually schedule about 10 minutes per interview and I typically do them during their recess/lunch. Click here to see my go to interview questions. Samples of what my K-Money looks like. Typically classroom jobs don't begin until the second or sometimes even the third week of school depending on the year and the class. Since jobs are paid via paycheck, I also have class cash. 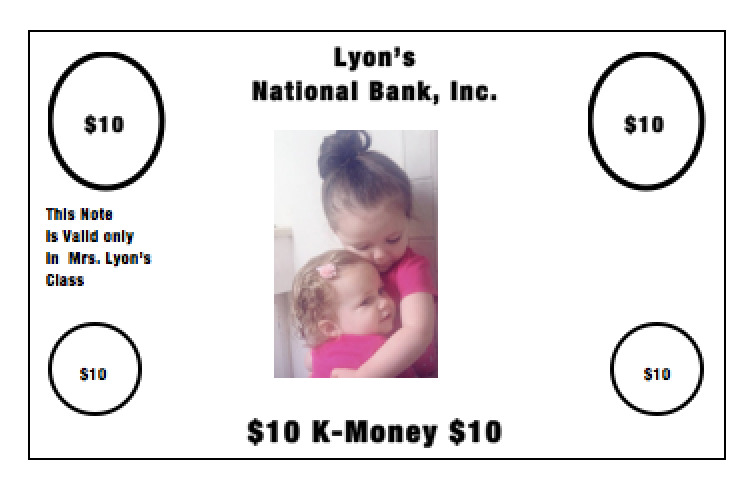 My cash is called K-Money which is because of my two daughters - Kenzie & Kaidyn. All the cash features pictures of them on it. :-) I deal only with $5, $20, $50, and $100 bills. Each of the different denominations are printed on different colored paper making it easy for me to know which are which. These I pull out on day one of school. Students begin earning class cash aka K-Money by answering questions and through good behavior. I make sure each student has earned some on day one as it gets them even more motivated....plus I need them to have a bit of money when I introduce the bank and checks which they pay a small fee for. ;-) I use the class cash all year long and even leave some out for any substitutes to hand out while I'm gone. 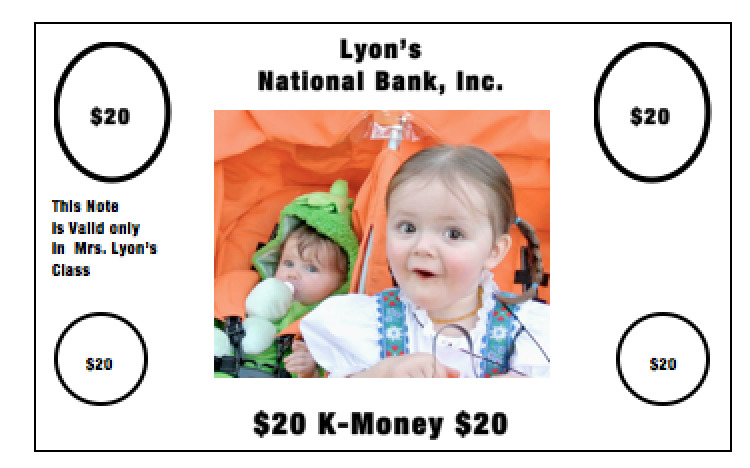 It's a quick and easy way for me to give incentives to my kids. In order for me not to run out of printed money (though I have a TON!) 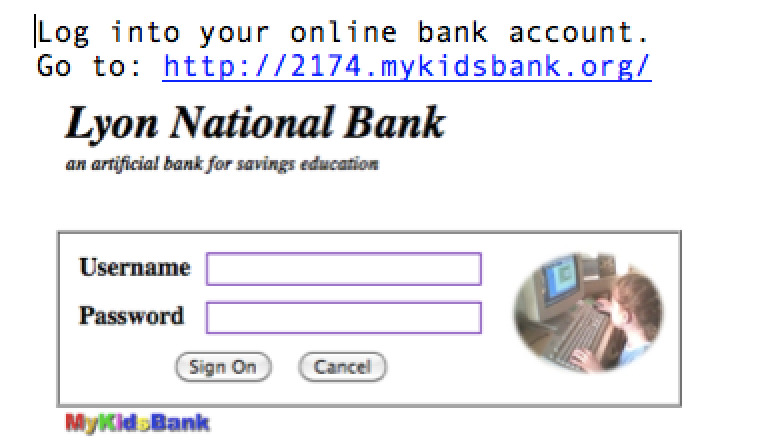 I do require students to deposit it into their checking account once we start the banking (usually about week 3-4 of school). They are allowed to keep about $500 in class cash to pay off quick fines if needed. Classroom job paychecks is probably my most favorite part about all the components of my classroom economy. I did a post on them last year but for sake of making you leave this post to go there, I just copied it over for you. I LOVE LOVE LOVE these paychecks. The students earn paychecks that look like a real check! 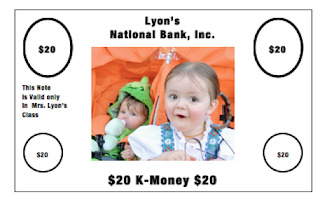 This allows me to add the element of banking to my classroom economy. 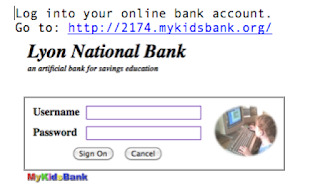 When students earn their first paycheck, we go over how checks work, what all those numbers mean, and I even invite a guest speaker into my classroom from a bank to answer the students questions. I'm happy to share this awesome spreadsheet and mail merge with you through my TpT store! 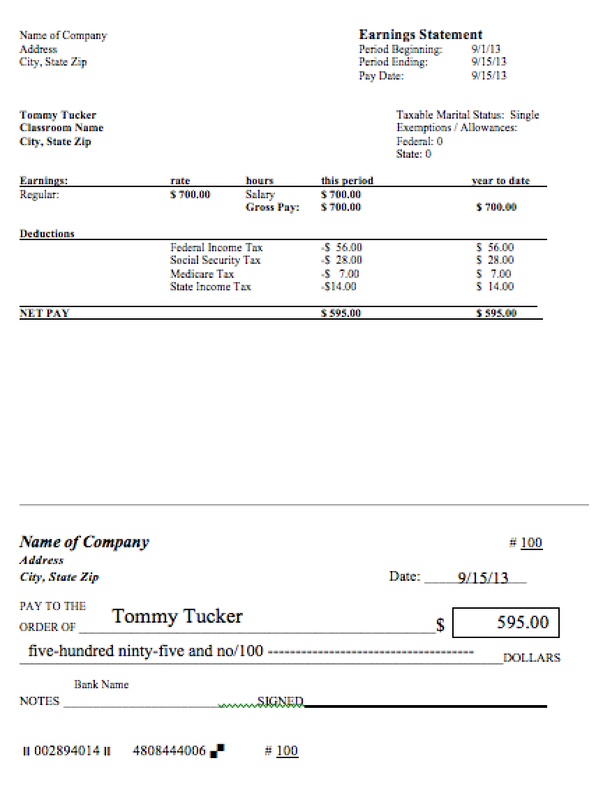 The zip file also includes an easy tutorial video to walk you through how to run your own classroom payroll. Students receive this with their unique username and password to get into their account. 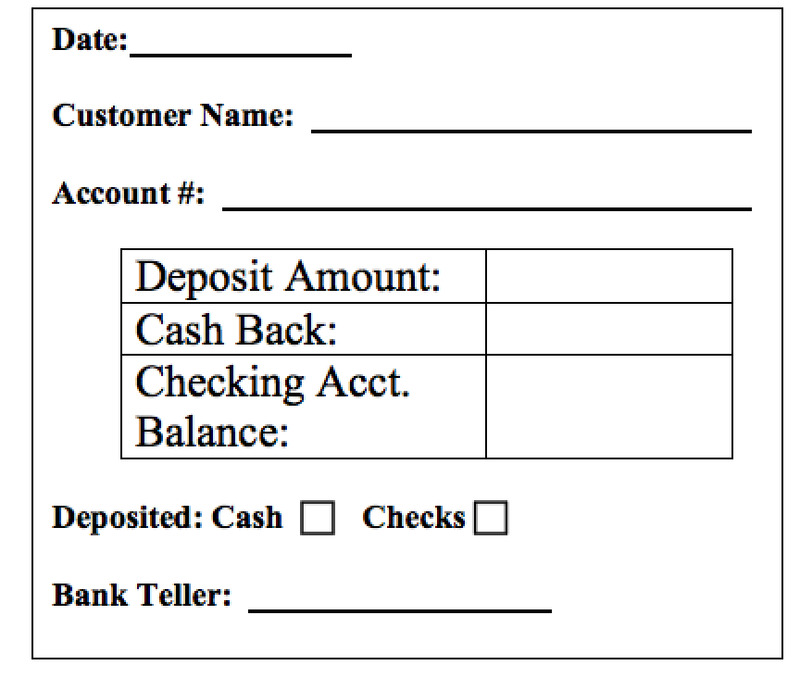 Here is what our deposit slip looks like. I also have withdrawal slips. Each "customer" gets a receipt after doing a transaction at the bank from their banker. 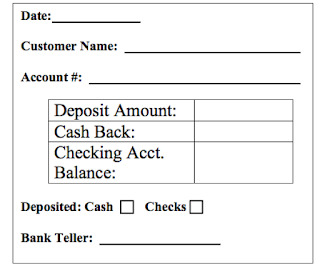 Students are required to keep an accurate check register of their account. YES! Students pay rent and utilities each month (usually I start this the 2nd month of school). Students are required to pay rent each month. However, I do offer the opportunity for students to "purchase" their desk. I typically make the cost of the desk about 3 months rent. If a student does purchase their desk, the no longer need to pay the desk and chair rent. However, they still pay for utilities. 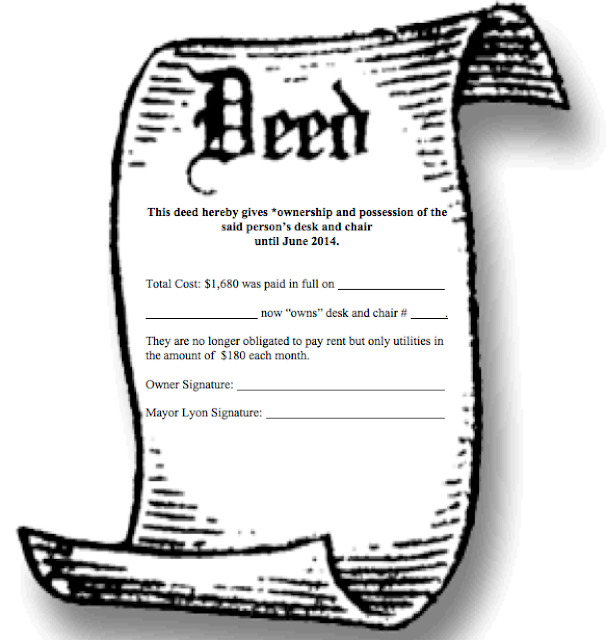 Students receive a Desk Deed once they purchase their area. In some years past, students were able to purchase desks of those students who had no desire to buy them. Those students would then be responsible for paying their new owner. However, I did have difficulty keeping track of that so I no longer do it. In addition to the bank, I also have Police Officers who help me collect fines from the class. 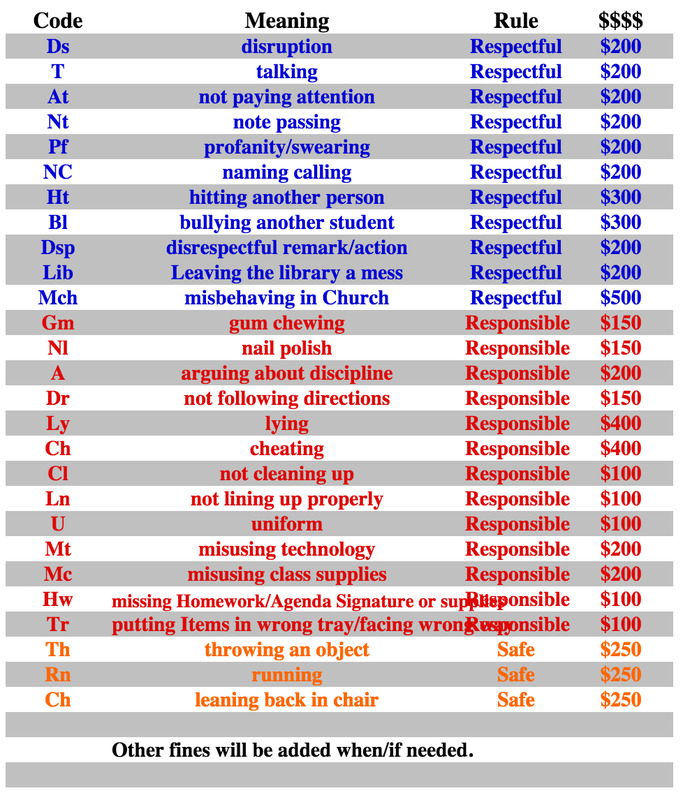 Fines are given out for a variety of things - here is a list of fines and the amount the students need to pay. Yes - they are steep fines but the idea is to make them not want to get these fines. 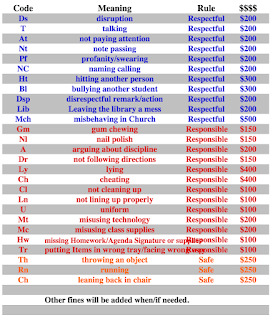 Each fine correlates to one of the classroom rules that isn't being followed but is broken down into three categories - Being Respectful, Responsible and Responsible. You can get my classroom rules posters for free here. Each student gets a copy of this for their binder. I usually have about 4-5 police officers each year. Each officer is in charge of a select group of students within the class. When a student earns a fine, they are told to tell their office. The officer then records the fine in their logbook (logbooks consist of a laminated folder that has an individual fine sheet for each of their assigned students). They record the date, the fine violation code and the fine amount. At the end of the day they add up each of their students' fines and collect the money. The students who are paying can either pay by check, cash, or direct deposit through their bank account to the city. This log serves a dual purpose - one it's a record for the officer to collect fines but two, it provides me with a behavior/work habit log that I can use if I need to have a conference with parents regarding a student. Honestly, this system works out so well for me. All I have to do is say "Tell your officer" and the students are responsible from handling it from there. In the beginning it does take a little bit of follow through from me making sure it happens, but the officers take their jobs seriously and will get it done. One thing to note - officers DO NOT hand out fines on their own. Fines are only given through me. Bonuses are another nice little addition to the classroom economy. 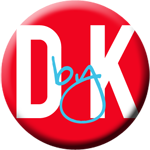 Students can earn cash bonuses through answering questions correctly, scoring well on quizzes/tests, being complimented from other teachers, birthday/other holiday gifts and more. I don't have set rates on most bonuses but there are a few. For example, if a student scores 100% on their spelling PRE-TEST (meaning they studied ahead of time) they get $100 in class cash. I also give "job bonuses" around the holidays. :-) The joy of this is I can hand them out at my discretion. So you may wonder, what do the students get to spend their classroom money on? During the year, I have two auctions - one after the first semester and one at the end of the year. It is during these auctions that the students get to spend their money (or hoard it - whatever!) on a variety of items. However, just like you, I earn a teacher's income so money can be tight. Enter the Swap Shop. The swap shop is a way for me to "purchase" my students' old toys, books, etc. You know how the saying goes - "One man's trash is another man's treasure." Well this is certainly true!!! Students are encouraged to clean out their closet and bring to me (with their parent's permission of course) old toys, books, DVDs, etc that they no longer want. I have a scheduled time each week that I accept these items. The students come up and show me their goods - I then determine if it's worth any class cash. If I think it's something that will sell, I will offer them a sum of class cash. They have the ability to accept, refuse, or negotiate a higher rate. I have a set rate on books and DVDs but most other stuff it just depends on what it is. I have gotten some pretty awesome stuff by operating the Swap Shop and easily make back 2 to 3 times back in class cash during the auction than what I originally paid for it. There are a couple rules to the swap shop - games and toys must contain all their parts, students must attempt to sell it to me (aka Swap Shop) first. If I don't buy it, they have the ability to make a private sale with another classmate if someone is interested. The variety of things students sell to me is amazing - costume jewelry, mugs, candles, picture frames, toys - you name it, they sell it. Parents love this as it allows them to "clean out" things too. Sometimes students will sell to me little trinkets that I know won't sell in an auction. If they are in good shape, I will usually still purchase them for small class cash fees and then I share them with the primary teachers at my school for their own prize buckets. It's a win-win for us all. During the class auctions, each student will have a post-it note that shows their balance of class cash and money in their account. I set the timer for about 20 minutes. I begin by holding up an item and give a starting bid. Students will raise their hand if they want to bid on the item and the highest bidder wins. Bidding wars often break out - it gets crazy fun. Students KNOW they are not allowed to bid more than they have and if they break this rule, they can be banned from the auction and economy altogether if necessary. My teacher assistant is in charge of writing the items down, who won the bid, and the amount it went for. Students collect their items at the end of the auction and pay at that time. They are responsible for deducting their bids from their post-it notes so they always know how much money they have to work with. Here are some sample cards and what they would say. 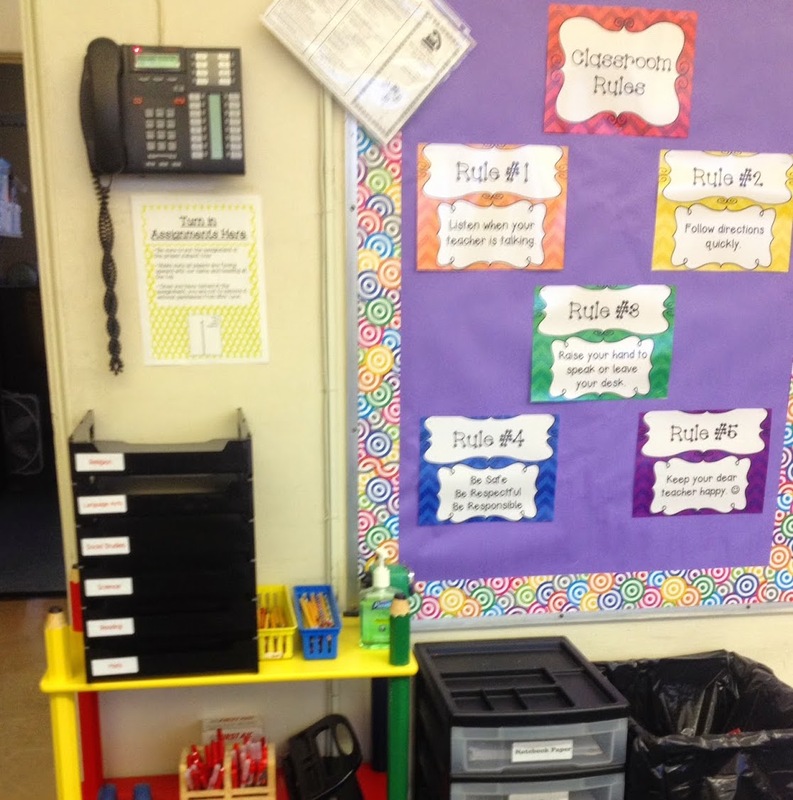 About halfway through the year, I introduce the idea of classroom businesses. 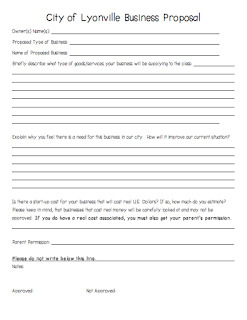 Students can fill out a business application and apply for a business license. Prior to doing this, we review the different between goods/services. 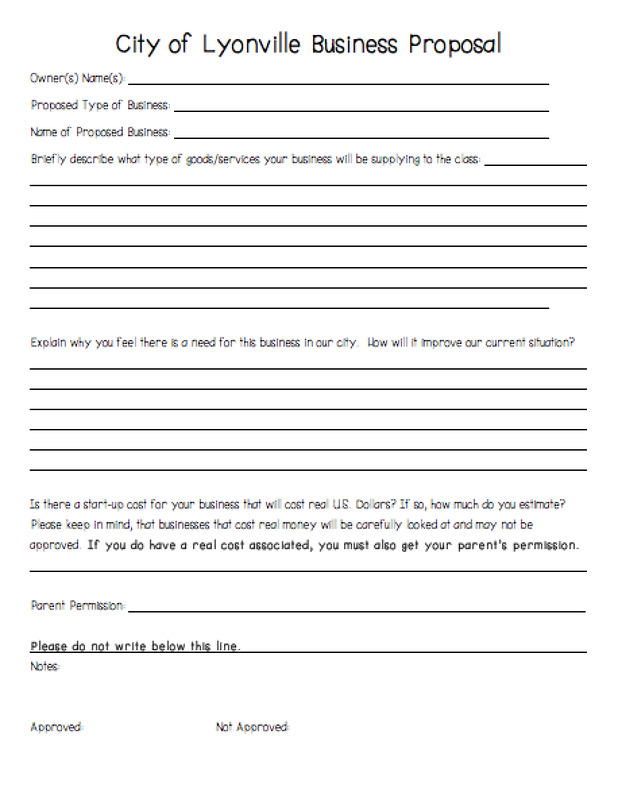 Students can then apply for license by filling out the business proposal. Students can run things like insurance companies where the other students pay them in case they end up with one of "Life's Little Happening's", check book decorating, tutoring and more. IF the business requires materials and real money, students must also get their parents' permission too. 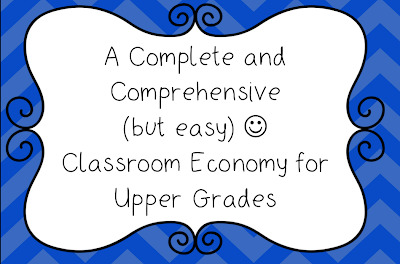 Do you have a classroom economy? What different components do you do? Share below.